At Barger & Sons, Inc., we use the best possible concrete construction practices and the highest quality products available when manufacturing every product. Below, you are walked through the high-points of the manufacturing process and delivery. Below is the H-20 traffic rated form with welded rebar cage ready to be poured. 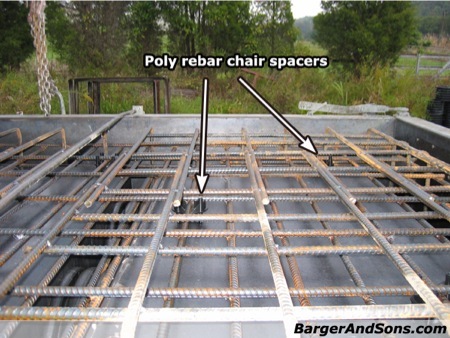 Notice the poly rebar chairs used to ensure proper rebar height and concrete embedment. Barger & Sons, Inc. works with a structural engineering firm to ensure that the tanks will perform as advertised. All pipe seals meet or exceed ASTM C923 specifications and allow for quick and easy installation. Pictured below, is a standard cast-in-place rubber boot that ensures a long-lasting and watertight connection. Every rubber boot used meets the vacuum and hydrostatic pressure requirements of ASTM C923. Sealant in the joint line is often overlooked as a failure point in tanks. A high quality sealant is as important as having reinforcing rebar throughout the tank. 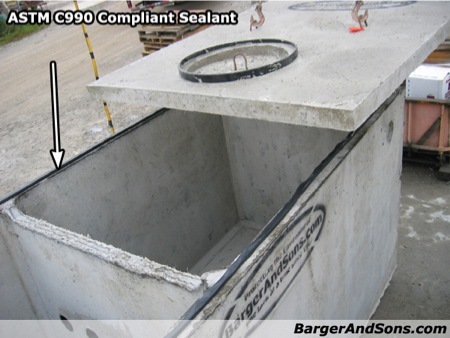 Barger & Sons, Inc. only uses sealants that meet or exceed ASTM C990. This ensures product longevity and a watertight seal keeping out unwanted water infiltration. Partition walls are poured monolithically with the tank body eliminating premature failures and leaks caused by very thin partition walls that either slide into place or are not tied into the rebar cage in the tank body. When a partition wall fails, this causes the grease interceptor to short circuit. Barger & Sons’ monolithic partition wall is tied directly into the rebar system and is as thick as 5” with a small taper. This eliminates leaks between compartments, makes for faster deliveries, and produces an overall stronger tank. 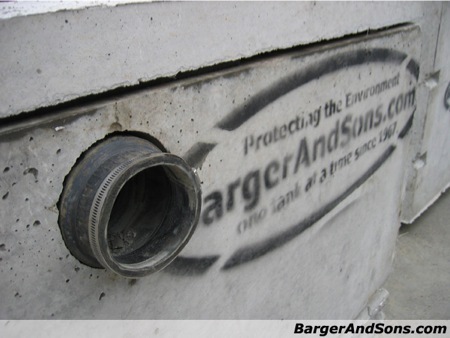 Some cities require a second partition wall in the design to stop grit and debris from entering the sewer system. 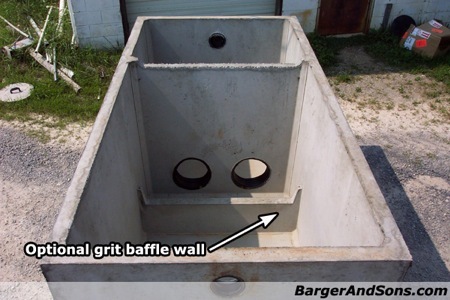 Barger & Sons, Inc. produces two variants of the grit separator. A 12” and 18” tall second partition wall, poured monolithically and tied into the tank body rebar system. This short wall catches rocks and debris from car washes, laundry mats, etc. This website is best viewed in the Apple Safari or Internet Explorer 7 web browsers (1024 x 768 resolution or larger).